I don't know why but I have been very hesitant to cook salmon. Until yesterday. I knew I had to do it soon or I'd go crazy thinking about it. My inspiration came from a delicious recipe for Maple Glazed Salmon that I found on Alanna's Kitchen Parade. It reminded me of the halibut my brother-in-law had made for us when we visited them a couple of months ago. 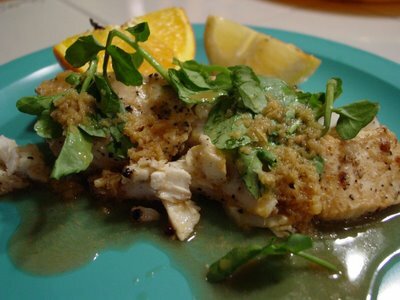 This is grilled halibut with ginger, citrus and watercress, a recipe from Williams-Sonoma's Fish, a book I highly recommend. Like the halibut, I wanted to grill the salmon but the weather gods decreed otherwise. We had a major thunderstorm with lots of wind, hail, and bright bolts of lightning; so I decided to give in to the universe and baked it instead. What follows is my adaptation of Alanna's recipe, influenced by the halibut recipe from Fish. Mix the maple syrup, soy sauce and ginger in a large bowl. Put the salmon in this marinade and marinate for 20 minutes. Line a baking tray with foil and grease with oil of your choice. Place the salmon on the tray, reserving the marinade for a sauce. 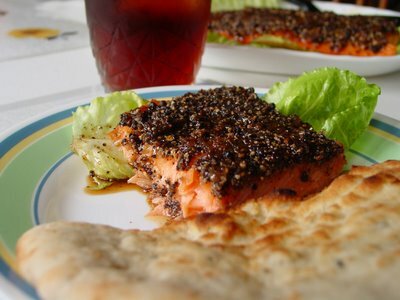 Press the coarsely ground black pepper onto the salmon and bake for about 6-8 minutes depending on the thickness of the filet. The rule of thumb is 10 minutes per inch of thickness. The salmon is done when it turns pale pink. Heat the marinade in a saucepan till it boils and simmer it until the salmon is ready to be pulled out of the oven. This ensures that any fishy leftovers in the sauce are thoroughly cooked. Pour this marinade over the salmon just before serving for an additional kick. I can't tell you just how ecstatic I am. This was quick, easy and Alanna's right, it is miracle food! Alanna recommends marinating the salmon for 4 to 48 hours in the refrigerator. I didn't have that much time on hand because, as usual, I was scrambling to get dinner on the table before everyone fainted due to starvation. Fish from Williams-Sonoma recommends marinating fish for only 20 minutes; after this, they say, the fish begins to cook in the acids in the marinade. I usually marinate my fish upto 24 hours in the refrigerator. I have done this with delicate fish like pomfret, too and the flavor only gets enhanced. I have never seen any 'cooking' but then again my marinades have not been overly acidic. Since I did not have much time on hand, I decided to forego the marination; also, I knew that I was going to pour the sauce over the fish so I didn't think marinating was critical. Isn't it funny how we manipulate things to suit the situation at hand?! Medha helped me crush the black pepper in my mortar and pestle. Oooh! Can I do that? She started coughing shortly thereafter because "it smelt bad" and left the rest of the job to me! Since Alanna recommended overdoing the pepper, that's exactly what I did! However, I didn't coat about 1/4 of the filet with black pepper in deference to tender taste buds. I served the maple glazed salmon with black pepper and ginger on a bed of organic romaine lettuce and peach tea. This recipe is a keeper! I am very thrilled! Maple-glazed salmon from Green Mountain at Fox Run, a women's retreat in Vermont. This recipe uses some ginger, not as much as I did, along with dijon mustard and scallions but no black pepper. 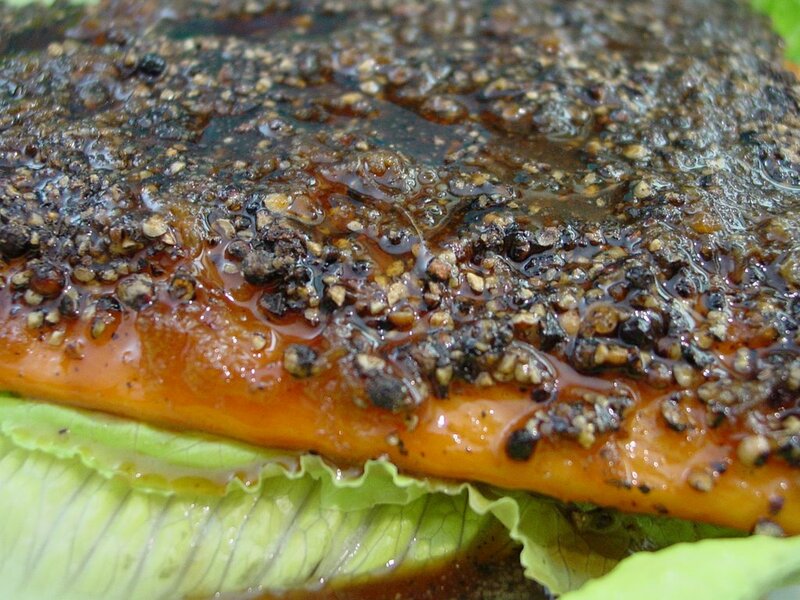 Pepper-Crusted Maple-Glazed Salmon from Food Network, which recommends an ideal marinating time of 24 hours. Hi Manisha! So glad your first salmon worked out so beautifully! And yes, I DO love how we adapt and re-create recipes to suit our taste, time and so much else. BTW I love your idea of using the leftover marinade as a sauce and think yes, that's a good idea if time is short. (I'll pass it along to my family, too, who make this all the time.) For testing, I actually DID make the salmon after only marinating an hour, 4 hours, 24 and 48 hours ... without the sauce, my favorite was the 24 and 48 hour versions. Alanna, the next time I make this I will marinate it for at least 24 hours, if not more. But it will take more planning from me than a last minute dash to the store to pick up salmon. I love the way you tried this out by marinating it for different times. It gives your readers that much more flexibility and confidence to know that what they are doing can only turn out tasting really great. I usually marinate my fish in ginger, garlic, red chilli powder and turmeric powder. Or just lemon juice and crushed black pepper. I then either shallow fry it after dipping it in cream of wheat (instead of bread crumbs) or cook it in a coconut curry. I've never cooked fish that was marinated in a sweet sauce before, so this was another first for me. The salmon filet I used was 1.35 lb and cost me less than $8 at Sam's, and I have enough leftovers to make another meal for two. So all in all, this sounds like a great win-win to me! Thank you, again! Whoops! I re-read my post, Alanna, and it sounded like I was saying that 20 minutes of marinating time should be the norm because of what the book Fish recommends. I have edited my post to clarify that I have and do marinate fish for longer with no 'cooking' effect. I also think what goes into the marinade makes a huge difference. For example, when I marinate pork or lamb overnight in the vindaloo sauce, you can see that the meat has begun to pickle in the marinade, which is what we want in that case. I apologize if it sounded like I inadvertently misrepresented your recipe! Shilpa, this recipe brings a very different taste to the palate. We are used to spicy and salty fish so this is a new experience. The maple syrup adds a wonderful sweet flavor. Furthermore, it's very easy with very little prep time and the clean-up is a breeze, too. Try it! Hi, am back to forward your post to my family. I didn't think in the least that you were 'misrepresenting' ... some days you have time to marinate, some days you don't. Don't worry, please! Manisha, the salmon looks absolutely fab. I love the crust on the top. Its been quite a while since we made any salmon. Meal planning is something I will never get. It is always a mad scramble to get things on the table. Thanks, AK! I hope your family likes my version! Gini, I'm with you on that one! Sometimes though the best meals are the ones put together with whatever there is on hand and in a huge rush. I get into this state mainly in summer. I am more organized during the school year as our days - weekdays really - need to be very structured. In summer, lunch is usually a sandwich or mac and chees as whoever is here at lunchtime gets lunch. That can mean anywhere from no-one to 5 kids. Dinner-time seems to suddenly creep up on me now that the days are long and then I'm scrambling! Let me know if you try this maple glazed salmon. The crust adds a wonderful zing to it. The success I had with this recipe is quite encouraging for me, as I am ready to try more recipes with salmon. wow....is that a co-incident or is that a co-incident! I 've been browsing through your blog a lot Manisha...I finished reading all your entries this week-end...and today I see you commented on mine!! So anyways, do try the marag and tell me how it came out, ok? Very restaurant like, i liked the third photo the most. I am more inclined to eating Halibut, but do try out Salmon once in a while,tastes so good when grilled. Manish..looks tasty enough to just help myself to some..I think i am going to try this. Maya is away at school, maybe she can even try this. If you want to solve it, here’s the link. Nabeela, your marag is a must-try on my list. I wonder if slow-cooking it would work, too. Or does it need to be pressure-cooked, you think? And, I am glad you enjoyed reading about our antics! That dentist episode was awful and we are still dealing with complications. We did find a really good dentist and a dental surgeon in the Chicago area. The surgeon is a very handsome version of Geraldo Rivera, so I figured I should also get a tooth extracted by him. :-D These guys were so good that they continued to give us advice even after we moved to CO. We actually flew back to Chicago this winter for a consultation when a Boulder periodontist was convinced a bone graft was required. Someone asked us how much we spent - well, we saved over a $1000 and a lot of pain! Archana, I must tell you what Medha said about the second photo...she said it looked like dirt. I used that to show just how much crushed pepper I loaded onto the salmon! I would try this recipe with Halibut, too. Do you have any tips when it comes to grilling salmon and/or fish in general? If you do, please blog about it. I am always afraid that the fish will crumble and fall through the grate! Indianadoc, I've baked fish before but never cooked salmon. It was in the oven for less than 10 minutes! Give it a shot and let me know if you liked it as much as I did. Starry Nights, the salmon was very good. The only ingredient I had to go out for was the salmon! It's very easy and super-quick. Vaishali, that was very cool! You did a great job playing with words. You should do this on a monthly basis and change the bloggers. When you do publish the answers, link to the bloggers so that those who couldn't figure it out or don't know the bloggers are introduced to them. Great idea! This looks so good and worked out perfectly. We too love salmon and I think this will be something I will be trying out soon. Expect the verdict on my blog. Manisha, I've never tried slow cooking it in a pot before...but it should work in theory...try cooking it for an hour on low flame/heat...because that way the falvors of the herbs will infuse in the meat and the meat will be fork tender. Meeta, I'll look forward to it, especially the photos you will take! Don't forget to tell me if you used ginger. It's not there in Alanna's original recipe. Nabeela, I'll try it in my slow-cooker. I made shahi haleem a couple of months back in my slow cooker and it was amazing. ooooh slow cooker...now that's an idea and it might really work! Manisha, good pictures!! We love salmon -baked, grilled or broiled. I too was worried about grilling fish until I tried it last year. It wouldn't crumble and fall off. Just make sure the grate is greased well, and do not disturb the fish for the first 5 to 8 minutes. Grilled salmon is so delicious. Nabeela, I think it might work, too. I wish I didn't have to wait so long to try it but I have 7 friends visiting me from Chicagoland for the holiday weekend and they are all vegetarian! As soon as they leave, we leave for CA. When I get back, marag is going to be the first real thing I cook, that's for sure! RP, thank you so much for your tips. I will try it out once we get back. Thanks to Alanna, I found a great resource on how to grill fish, pictures and all! 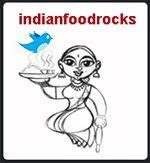 Priya, that looks like a very interesting web site with a focus on Kerala cuisine. I don't know much about Kerala cuisine and so far I am loving what I am finding out! Thanks! I love pepper and looking at so much pepper on the fish...it looks delicious! Mythili, I had visitors, followed by a trip to California. Glad to be home again! Sumitha, I love the pepper, too. It's a wonderful combination of sweet, salty, and spicy! Try it! It was really nice reading all the comments made about Indian food, I am huge fan of Indian food, although i did have a tough time with my tummy initially, but later my tummy also got used to it. I feel indian food is just pure culinary delicacy. I also happened to read about a website http://www.click2cook.com and had a chance to visit it too. A good place to hunt for Indian food. Celine, welcome to IFR! The spices can be difficult to handle if you're new to it. However, Indian food does not have to be hot. The food I cook tends to be easy on the chilli powder as well as red or green chillies. I've seen click2cook before but I haven't tried any recipes from there. Do let me know if you do and how you liked them! It's always great to find new sources of recipes!